The BASF Near-Zero Energy Home in Paterson, New Jersey has earned the definitive credential in the green building industry -- a Platinum score from the U.S. Green Building Council's LEED®-H rating system, making it the first single family residence on the east coast of the U.S. and second in the country to earn this prestigious certification. The model home demonstrates to a national audience how we can collectively help build a carbon neutral future. In this way the project represents a carbon-neutral model for residential housing nationwide. The BASF Near-Zero Energy Home in Paterson, New Jersey has earned the definitive credential in the green building industry -- a Platinum score from the U.S. Green Building Council's LEED®-H rating system, making it the first single family residence on the east coast of the U.S. and second in the country to earn this prestigious certification. 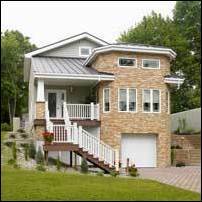 In late 2005, the BASF Near-Zero Energy Home was selected to participate in a stringent peer review as part of the US Green Building Council's Leadership in Environmental Design for Homes (USGBC LEED-H) pilot program launched that same year to promote the design and construction of high-performance, green homes. "Transforming the residential market to green building is critical to our efforts to halt global climate change," said Rick Fedrizzi, President, CEO and Founding Chairman, USGBC. "By earning LEED Platinum certification for the Near-Zero Energy Home, BASF is having an immediate, measurable impact on energy use and CO2 emissions--not to mention providing a family with a healthy, comfortable home. BASF's Leadership in achieving LEED Platinum certification sends a powerful message to the marketplace, and will help accelerate the adoption of green homebuilding nationwide." Jack Armstrong, Manager of Construction Industry Sector for BASF, explained, "We participated in the LEED-H pilot to shed light on BASF chemistry as the enabling technology for zero-energy and high-performance homes." He cited BASF's expandable polystyrene, polyurethane foam sealants, and cool metal roof coatings as the BASF ingredients that optimize the home's performance. Independent analysis conducted over the second half of 2006 provided measurement of the home's performance in several areas including indoor-environmental quality, energy efficiency and overall environmental impact. The key finding: The BASF Near-Zero Energy Home is 80% more energy efficient than the average home. Another central feature of the home is that not only does it save energy, with the integration of solar energy, it produces energy, as well. "There are many days that the electrical meter moves in reverse allowing the homeowner to sell the excess energy back to the utility company," Armstrong stated. "In this way the project represents a carbon-neutral model for residential housing nationwide." Touting other benefits, Armstrong added, "The BASF Near-Zero Energy Home also delivers increased durability, affordability, ease of construction and improvements in indoor environmental health and comfort." In the first quarter of 2007, the home will be donated to St. Michael's Housing Authority and then turned over to a family with a teenage boy who is living with quadriplegic paralysis. As such, the home was designed to incorporate elements of universal design, demonstrating BASF's commitment to providing real-life solutions for people with diverse needs. Other awards for the Near Zero Energy Home include The New Jersey Clean Energy Award, the (New Jersey) Governor's Award for Environmental Excellence, and the 2006 Leadership in Responsible Land Use award from the Urban Land Institute. In addition, the home was certified by the Institute for Business and Home Safety as the first home in New Jersey to receive the Fortified … for Safer Living® certification. The BASF Near-Zero Energy Home is part of the BASF Better Home, Better Planet Initiative aimed at educating the building community and general public about sustainable design and environmental stewardship. Other BASF projects underway include the revitalization of an inner-city neighborhood in Philadelphia; the development of a wildlife refuge in Rensselaer; post-Katrina rebuilding efforts; and projects in China, Sri Lanka and India. BASF Near-Zero Energy Home strategic allies include: Chrisner Group, City of Paterson, Environmental Design + Construction, GRAD Associates, Green Ideas, Insulspan, Rehau, KBI Contractors, MBDC, New Jersey Energy Star® Program, American Polysteel, St. Michael's Housing Authority, Steven Winter and Associates, Sustainable Buildings Industry Council, New Jersey Chapter of the U.S. Green Building Council, U.S. Housing and Urban Development's PATH Program, and the U.S. Department of Energy. BASF Corporation, headquartered in New Jersey, is the North American affiliate of BASF AG, Ludwigshafen, Germany. BASF employs about 16,000 people in North America and had sales of approximately $11.3 billion in 2005. For more information about BASF's North American operations, or to sign up to receive news releases by e-mail, visit http://www.basf.com/usa. BASF is the world's leading chemical company: The Chemical Company. Its portfolio ranges from chemicals, plastics, performance products, agricultural products and fine chemicals to crude oil and natural gas. As a reliable partner to virtually all industries, BASF's intelligent system solutions and high-value products help its customers to be more successful. BASF develops new technologies and uses them to open up additional market opportunities. It combines economic success with environmental protection and social responsibility, thus contributing to a better future. BASF has approximately 94,000 employees and posted sales of more than €42.7 billion (approximately $50.4 billion) in 2005. Fortified for Safer Living® is a registered certification mark of the Institute for Business & Home Safety.